Hi guys Looks like winter is here and our long summer is behind us which for me brings a smile to my face. Over the past week or so all rivers both locally and backcountry have been high and at times unfishable. The high regions of the central plateau received some good snow and the area has a winter feel to it most days. 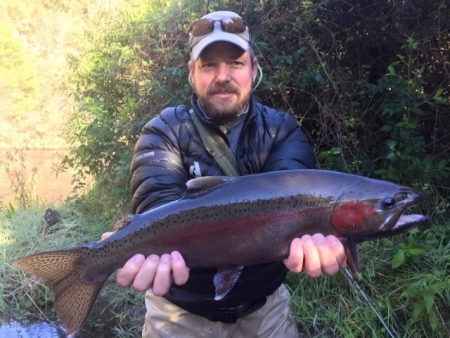 We have already seen some good fishing which actually started of in Lake O fishing the canals when rivers were dirty but now has transferred to rivers as they drop and receive the first decent runs for the winter season. 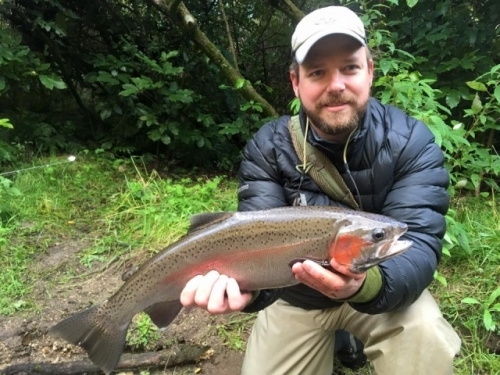 The Tongariro has got some fresh fish in it but plenty of anglers seem to be picking the good ones from the bridge pool most mornings, this will continue all winter till there are no more left. The upper sections still seem to have good numbers of browns and with that slightly high waterÂ a few good fish were caught, some silver running browns also entered the river with the new fresh. Â I guided yesterday on the Hine which for the next few months will most likely be the bestÂ peforming Â river given the results from the last few years. This river has been running high for the past couple of days and is at a high but fishable level with good colour. We hooked fish in every pool nymphing heavy with a glo bug, some fish were touching on 5lb which was great to see. There seems to be a mixed bag in here already with silver bullets coming in most nights but some really dark fish which must have slid in weeks ago. Anglers were in most pools down river but the upper section wasÂ relatively un touched, Im sure this will change in the coming weeks and once again this wee river will get a hammering until other rivers produce. Â Outdoors men have had a good month or two between fishing and hunting. 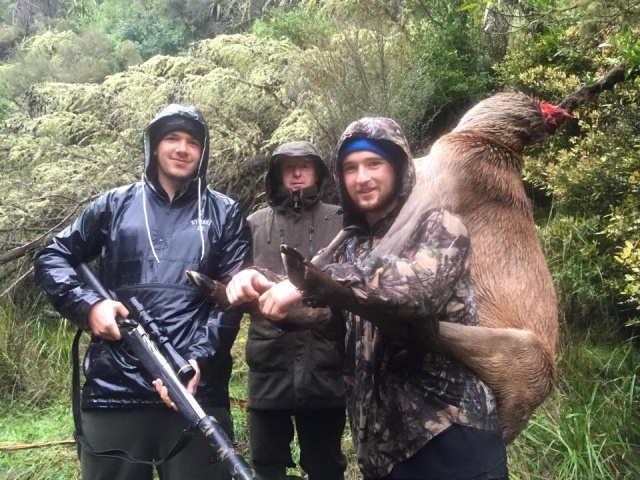 The last few weeks have been prime time to hunt the deer which call NZ home and many others are looking forward to May which is the opening of the Duck hunting season. I must admit I love both of these events and have taken part lately in droppingÂ aÂ few animals with various clients. Last week I spent two very wet day and night in the bush with Vern and two of his boys. I have not seen rain and wind like this for ages and it was not suprizing that the deer were tucked up in the thick stuff and hard to get onto for the most part. Thankfully we were able to sneak in on a small group of animals which were beded down in the fern and unknown to them take one of them for meat. All good fun until one has to carry it back to camp up hill in wet slippery conditions (one step forward two feet back), the warm winter kai will taste all the better eh. Watch the weather guys, winter fishing is here and it will be a good time to drown a glo bug.